We may have slightly different perspectives on the most important aspects of Montessori, but I think the following will get the ball rolling. Montessori is a scientific method of education, a philosophy of child development and an approach to children that helps them increase their potential. Doctor Maria Montessori, who lived from 1870 to 1952, was a brilliant and creative educator. Beginning her studies, Montessori relied on the work of the French physician Itard, his pupil Seguin and Jean-Jacques Rousseau. Rousseau stressed the importance of training the senses as a means to achieve knowledge, and explained the learning process as gradually moving from the concrete to the abstract. Itard and Seguin successfully developed graduated exercises to enhance the development of special needs students. Respect for the child is the cornerstone on which all other Montessori principles rest. We show respect for our children when we help them do things and learn for themselves. When children have choices, they are able to develop the skills and abilities necessary for independence and positive self-esteem. Respect for children is never out of date and should be afforded to all children, regardless of culture, gender or socioeconomic background. But Maria Montessori’s most important discovery was that children learn in a fundamentally different way than adults. A young child has an innate ability to "absorb" language, as well as other types of knowledge. When Montessori studied children’s natural ability to absorb knowledge, she discovered that they learned best when they were free to work in a carefully prepared, nurturing environment. In time, Montessori went on to create schools where children worked with specially designed learning materials (manipulatives) that enhanced their potential. A Montessori classroom is a specially prepared learning environment designed to meet the developmental needs of children and to appeal to their diverse learning styles. The Montessori environment is also prepared to foster independence, grace and courtesy, and a sense of personal responsibility. Each classroom is organized into five curriculum areas: practical life (activities for daily living), sensory education, language skills, math and the cultural subjects, which encompass the arts and sciences. Montessori also believed that, given long stretches of time in which to work, children will gradually lengthen their attention spans. In her opinion, rushing children along to a different activity or subject every 30 minutes makes it impossible for them to become engaged in any one task. It makes sense to me — if I’m in the middle of a really good book, or an art project, I would rather not be disturbed. The Montessori curriculum comes alive to the child when a link is created between the child and their learning environment. The Montessori teacher, or directress, provides this link. 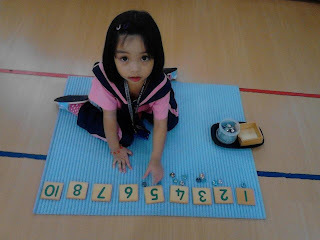 The Montessori teacher is an observer whose ultimate goal is to intervene less and less as the child develops. The teacher creates an atmosphere that is calm, joyful and orderly, while encouraging the children in all their efforts, allowing them to develop self-confidence and inner discipline. The teacher is more involved with the younger students at each level, demonstrating the use of materials and presenting activities based on the child's needs. Knowing how to observe constructively and when to intervene are some of the most important talents the Montessori teacher possesses. They teach the child to be a capable learner, and guide them to take their place as caring, responsible and compassionate members of the community. We do many things in a Montessorian way without even thinking about it. What Maria Montessori wanted us to understand is that children can’t help learning. Simply by living, children learn from their environment; they are born to learn. But what they learn relies greatly on the environment prepared carefully by an experienced teacher. If the Montessori method sparks your interest, I encourage you to visit a program in your area. Diane M. Bauso is head of school at Creative Minds Montessori, 169 Genesee St., Auburn. For more information, call 406-9495 or visit www.auburncmms.com.